Working with Heights Venture Architects, T&D Engineers designed this upscale wine lounge located atop 20 Waterway with a dramatic view of the Fountains at Woodway Square in The Woodlands. 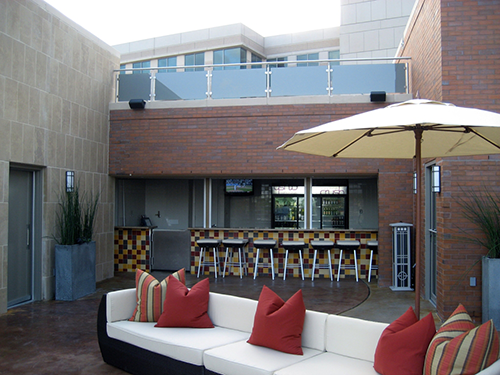 The lounge includes a serpentine onyx bar, intimate seating areas, and a wrap-around outdoor terrace; while the rooftop patio allows people to enjoy the surrounding skyline while sitting around the custom open fire pit. Low voltage pendant lighting accents the European resort style with stainless steel spot diffusers providing cooling and visual accents throughout the space. Conditioned wine lockers allow patrons to keep their favorites wines ready for their next visit. The design produces a relaxing atmosphere, making Crush Wine Lounge the perfect place to enjoy a glass of fine wine.